When I was reorganizing my supplies recently, I came across this cute Sizzlits die, Floral Fusion, that I haven’t used in a really long time. And I love this die, so I kept it handy, knowing I wanted to use it when the right idea came along. I thought it would work perfectly with this sketch. I looped some crochet thread around under the flowers and bow just for a fun touch. There’s a lot of white space on this card, but I like it against the contrast of the bold, bright colors of the Quatrefancy dsp and flowers. The sentiment is from A Dozen Thoughts. This entry was posted in Floral Fusion Sizzlits. Bookmark the permalink. Amy, what a fabulous take on the sketch, I love it! The cluster of flowers, ribbon and twine is just gorgeous, yet you still have all that white space. Well done. This is lovely!! 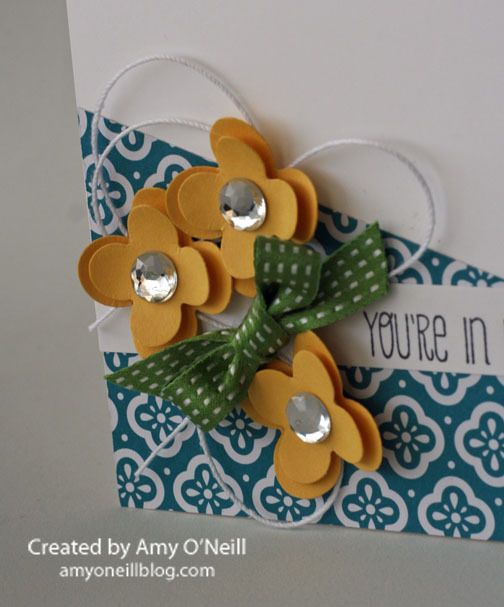 The colors are so pretty together and I love the dimension with the flowers and the twine. Isn’t it fun to clean and find something that you love to use again? It is like going shopping but you don’t spend any money! Great take on the sketch!! Absolutely love this card!! It just might be the inspiration I needed! TFS! In your hands, Amy, white space looks fantastic. When I try it on my own cards, I feel like something’s missing LOL! The colors and flowers are fabulous! This card is so simple and elegant, I absolutely love it! Love the color combination. Simple and beautiful. Thanks. This is very pretty!! Love the sweet little flowers!! So pretty, what a great use of the sketch.